"Very moist and good for you too! I adapted this recipe from a cake recipe, so it's yummy, but also quite healthy." Preheat oven to 350 degrees F (175 degrees C). Grease 20 muffin cups, or line with paper muffin liners. Mix water and flax seeds together in a bowl. Stir all-purpose flour, whole wheat flour, baking soda, and salt together in a large bowl. Add carrots and chopped apples; toss to coat. Stir applesauce, white sugar, brown sugar, olive oil, eggs, walnuts, and flax seed mixture into the flour mixture. Mix until batter is well combined. Spoon batter into prepared muffin cups, filling each cup about 3/4 full. Bake in the preheated oven until golden and the tops spring back when lightly pressed, about 18 minutes. 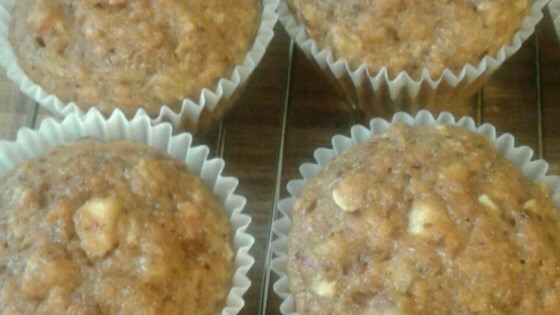 See how to make apple muffins with a crumbly cinnamon topping. These were just okay. My toddler loved them, which is really what I was looking for, but for myself I would add some cinnamon and/or nutmeg to increase the flavour. They were a bit bland as is. These were good. I made a minor modification because I didn't have any flax seeds. I omitted them and substituted 6 T. Of plain yogert for the water. I'll make again. Very good flavor. I mixed the wet ingredients first then I added the dry ones. Will most definitely make them again. My family loved this muffin recipe. Moist and delicious. I also added some raisins. Would definitely make these again.